Sell the job. Schedule the job. Do the job. Smart Service is the key to unlocking office scheduling efficiency, but your company’s time savings shouldn’t stop when your workers leave the building. 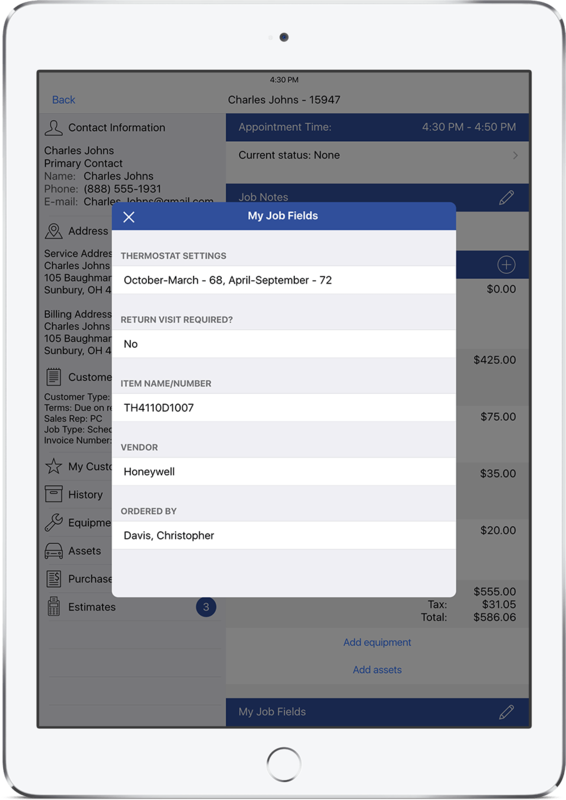 Equip your technicians with the mobile field service app iFleet and you’ll be shocked by how much easier work gets. Techs will enjoy sudden access to schedules, contact information, equipment records, service histories, company forms, and more with our robust field service app. Right now, your customers are just sitting in QuickBooks. Install Smart Service field service management software and you can start scheduling work for them. 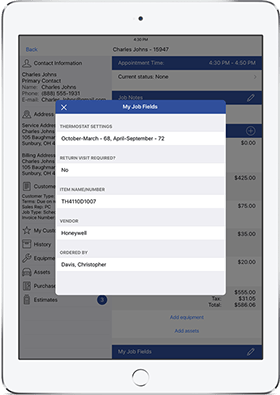 Add the iFleet field service app and you can dispatch that work straight to your employees’ mobile devices. They’ll do their jobs, then send completed work orders back to the office, creating ready-to-bill invoices. Start wrapping up your jobs in record time! Click a button in Smart Service, and you’ve scheduled a job. Click another, and you’ve sent that job to iFleet. Recurring work, emergency work, multi-day work, there’s nothing this field service app can’t handle. At the beginning of each day, your employees will find their schedules waiting for them on their mobile devices. No more slow starts, confusion, or mornings lost to horseplay. iFleet offers a better way to manage service work orders. No doubt, you already have an array of custom forms to facilitate your job process. No doubt, you’ve seen these forms come back covered with ketchup, water, dirt, and illegible handwriting. iFleet will end these woes. 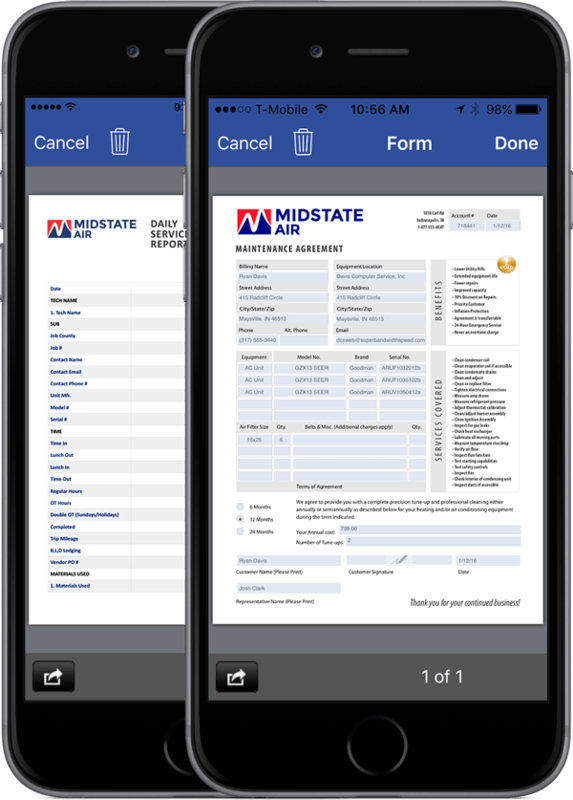 Digitize your existing forms and bring them into our mobile work order app as fillable documents. 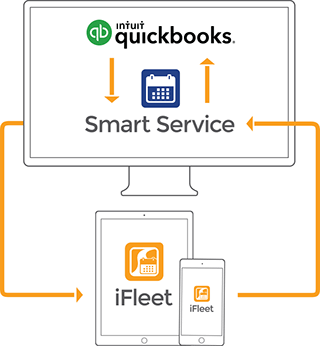 With iFleet, techs can fill and file paperwork in the field, instantly sharing completed paperwork with office personnel. Request an iFleet demo to see how it works! Every business is different, which is why iFleet was built with flexibility in mind. Some companies want to give their field crews access to everything. Other teams need to limit the information that their members see. Whatever the case, iFleet lets you manage work order deployment the way you’ve always wanted. User-defined fields let you track any data you can think of, from building age to pH level. iFleet is a field service app that scales with your business without adding hassle or costs. Need to add a door code or mean dog warning to a work order? 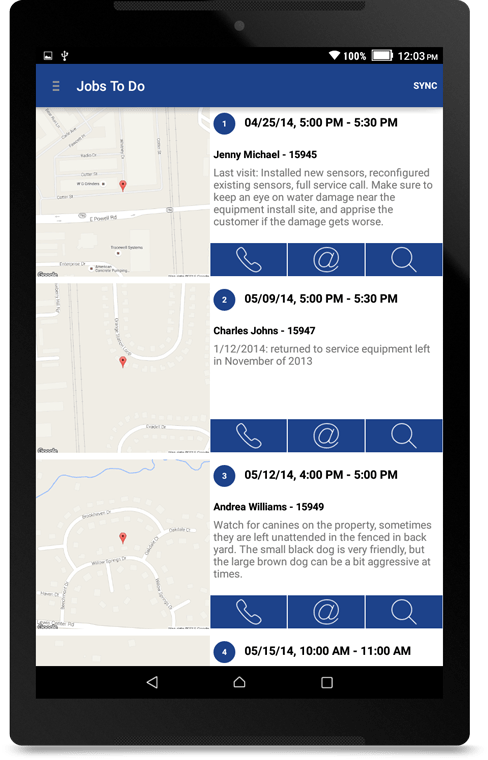 Tap in a quick job note and your techs will be on the lookout! Keep everyone prepared with iFleet. Adding a picture to a work order is easy. Simply, point, shoot, and save. Mark your job progress and impress your customers with some nifty before/after breakdowns. An iFleet crew never has to wonder about what they’re doing next or how to get to a job site. A simple tap pulls up GPS directions when things look bleak. When determining how to fix a customer’s problem, it’s often handy to consult iFleet for a look at the past services your company has performed. Ever shown up for repairs only to discover you don’t have the right tools to get the job done? The equipment information housed in iFleet renders this frustration obsolete. Do you need to track employee time for billing or payroll purposes? iFleet does that! Worker timestamps can even be corroborated with GPS breadcrumbs. In the hectic course of the workday, purchase orders often fall through the cracks. Track them in iFleet, and you’ll never let a part go unbilled again! Managers work hard to track their team’s locations and job progress. iFleet makes this once-painful process a breeze by giving bosses real time reports. With iFleet job notifications, your customers always know you’re headed their way. Order work months in advance, and watch as reminders get sent out automatically. 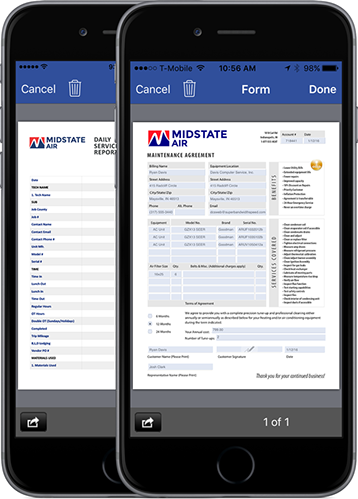 Check out our mobile field service apps! Appliance repair apps help you fix up your workflow. Set jobs and manage project with construction scheduling apps. Electrician apps supercharge your scheduling and time tracking. Elevator service apps will push your scheduling to the next level. HVAC apps will push your scheduling to the next level. Easily schedule and dispatch work with pest control apps. Unclog your company’s workflow with the right plumbing apps. Easily schedule and dispatch work with tree service apps. 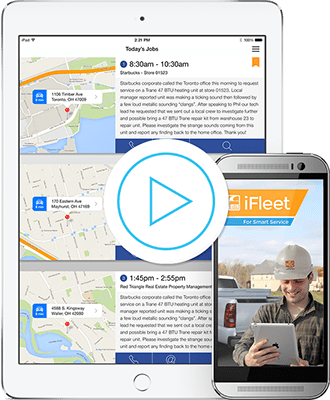 Request an iFleet field service app demo today!